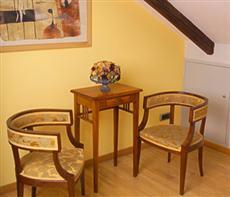 Arcadia Residence offers the convenience of an apartment in Prague with the services of a hotel, at competitive prices. The residence provides courteous and personalised service that only a careful family managment could guarantee. It has an enviable location in a peaceful, historic quarter just a short distance from the Old Town but away from the chaos of conventional tourist routes. There is an Internet Point in the reception area which guests are free to use. The reception is open from 7 a.m. to 11 p.m. and during the night there is always someone available in a flat only a few metres from the reception area (on the ground floor).